I just signed Gretel up for a 6-week nosework class. I’ve been wanting to try it with her for a long time. We did sort of try it once at the Portland Pet Expo last year. They needed some dogs to help demonstrate nosework on the stage and I volunteered Gretel. Now she will get to try it legitimately. She is so food motivated and has a good nose. However, I think this will honestly be a challenge for her. I am no dog psychologist but I was to put my “science-y” hat on I would guess that most domesticated dogs are not used to working, or looking, for their food. The food magically appears in their bowl every day and treats are put right in their mouths by our hand. I came to the conclusion that, although Gretel has a good nose, she gets confused when she has to look for treats. I’ve started tossing a handful in the dining room for Chester and Gretel to to “scavenge”. Some of the treats roll under the edges of things on the ground. Sometimes she passes a treat up the first time if she can’t immediately see it or takes a while to make it over to where it is. Nosework, or any “working” sport, is supposed to help your dog gain confidence. Confidence is something I have tried to instill in Gretel since we adopted her. She is such a fearful girl. She has made progress thanks to things like hiking and the little bit of agility and training we’ve done. I feel like she has been backsliding a little though since I’ve been working from home. Gretel is really attached to me and that obsession has gotten stronger now that she see’s me all day on most days. She has barked at S a couple of times in the last month when she was by me and he came into the room. At this point we aren’t sure it wasn’t because it was dark in the room and he came in quickly but she has never done that before (and I feel like we’ve had plenty of situations like that in the past). I am hoping that nosework will teach her to be a little bit more independent and give her a sense of autonomy. The first class in the series is actually today but I have to skip tonight. I’ll have some homework to work on with her before class next week. I have to collect some boxes and practice with treats in the open boxes like to see in this video (it’s got some loud music so you might want to turn the volume down). We’ll keep you posted on how it goes. 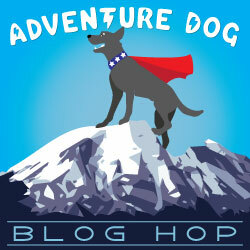 This is part of the Adventure Dog Blog Hop hosted by yours truly, DOGthusiast and Tiffany’s Diamond Dogs. Clicking the little thumbnails down below will transport you to other doggy adventures. Don’t forget to join us on Twitter the third Wednesday of each month at 5 pm PST/8 pm PST for #AdventureDogChat. Join the Twitter chat on the third Wednesday of every month at 5pm PST. Use the hashtag #AdventureDogChat to join! How to participate in a Twitter chat? Check out this post for how to participate in one. More questions? Ask in the comments below! I’ve really wanted to get Mauja invovled in nose work as a confidence builder as well. I just wish we had a class in our area! Oh, can’t wait to hear how Gretel does! It will be an interesting learning experience for me. Part of me thinks “how hard could it be for her? She probably won’t be challenged much” but that is probably because I don’t know much about it. Nosework and jobs are great for building confidence! I am a skeerdy cat (yes me, a giant, diva GSD) but when I do tracking, I tune out all the skeery noises and stuffs and focus on my job. It’s really helped me build confidence and mom and dad love watching me work. You got this Gretel!! We just started a beginning obedience class because I want to get her into agility. That’s a really neat video that you posted. The fact that it can build confidence in a fearful dog is also intriguing- we foster dogs, and some could really use that confidence booster when they come to live with us 🙂 Maybe we’ll give this a shot when we get our next foster pup in the next few weeks! it’s supposed to be really easy to teach but I tried to wing it on my own and had trouble with Gretel seeing me hide the treats and going straight or them 🙂 I’ll post about how we do it in the class. So fun! I’ll bet Gretel does great once she turns her thinking brain on. The nose work classes here are super-serious tracking type classes, so we haven’t tried. I’m looking forward to hearing how the nose work class goes. I can’t imagine Milo doing very well with something like this. He is really food motivated but won’t work hard to get treats unless they are in his Kong ball. I often put Gretel’s treats in a treat toy. Boy does that girl work at it! Nosework is SUPER easy to teach and for the dog to learn! She’ll be addicted in no time. My chiwini loves it and it’s a great winter activity for both my dogs to do inside to wear them out on rainy days. Also a great confidence builder! Keep us posted! What I really like about it is that once she learns, we can do it anywhere…..even at “stranger’s” houses or hotels. I’ve seen videos of people doing “urban” nosework too where they hide stuff under trash cans and the like. The dogs learn to hunt for the treats even in large crowds. Now THAT wold be amazing for Gretel to learn since she is timid around people. Can’t wait to hear more about your nosework training as you go through the course. You and Gretel are sure to love Noseworks! It doesn’t even matter how well she (or you … you’ll be a team) do. My dog Zack is a wiz, strutting proudly after each session. Zoe is not very fast, but I can tell she’s having a blast nonetheless! I’m looking forward to reading more about how Gretel (and you!) do. Nice! I wish you the best of luck with it! I have done a little bit of nose work with the huskies. Mostly just on rainy days for an inside activity. They have done pretty well with it. Rainy days….exactly. It’s been dumping here lately and I don’t expect it to let up for, oh, around 8 months. This is something we can do indoors without a lot of special equipment. Once I get some lessons for Gretel I am going to start teaching Chester too. Bet she’ll love it! Can’t wait to see how the classes go 🙂 We do search games with everyone’s kibble around the house and try to do it once weekly, but I love the idea of having the box courses! We’ll have to try that and make the game a little harder next time. We didn’t know about the Adventure Dog think will have to check that out! So much fun! I can’t wait to see how it goes. Mom brought me to a workshop, and I did fine. 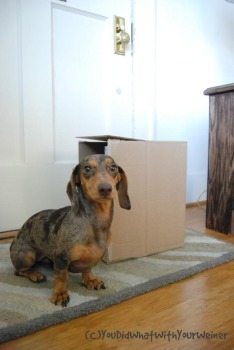 We practiced with the boxes for a while. Now she hides my dental treat for me every single night. I turn my lazy nose up to high gear and find my treat! Good luck, Gretel! You and Gretel will love it. Bailie and I have been doing it since January and just love to do it. It gets even more fun if you continue on to odor and looking for hides in the four search areas. Boxes get boring after a while. I bet Gretel will surprise you as there is more to nose work than most people think. There is a method to how to hide treats and how to reward us for the find. It’s a wonderful sport! You can check my blog under the nose work category to see my posts on it and actually today I just had a post about my first trial with photos. How exciting for you and Gretel! Stetson loved doing K9 Nosework. We actually got him through his first ORT before we got side tracked with Dublin’s training. Now that Adelle is going back to school we plan on getting both Stetson and Linus back into Nosework. As I mentioned Stetson loves it, but I want to get Linus into it to build his confidence. I can’t wait to hear more about Gretel’s nose work training. Well, I just had to drop out of this class. I hope to take one in the future but I just couldn’t make it work with my schedule. Did you blog about your experience at all? I am going to have to read about some of my friends doing it and practice at home with Gretel until we can get into a class. I think I wrote one or two blog posts about K9 Nosework, but I don’t think I wrote much about “how to”. I just looked up classes in our area and they start up the end of October. If I enroll Stetson and Linus I’ll probably put together some more comprehensive blog posts on how and what we’re doing with Nosework. You might check out Alfie’s Blog. I remember seeing a few videos on Nosework on their site.